I became a marketer somewhat by accident. I still remember filling out college applications, answering the fretful, "What do you plan on doing with your life?" question with that annoying confidence only a 17 year old can possess. I knew I would be in magazine journalism. If that confidence wasn't annoying enough, I went above and beyond applying to dual major programs: magazine journalism and marketing. Being forever indecisive I thought on the surface it made me look like an ambitious prospective student, while underneath I secretly hoped it would prove to be a smart "back-up plan". I got accepted into Syracuse, ended up transitioning my magazine journalism degree into a graphic design degree, kept working toward that back-up marketing degree, and added a psychology minor because why the hell not. I was convinced my marketing and psychology back-up plans would make me a better graphic designer. That's all marketing ever was and would be – a back-up plan in case I failed miserably and needed a way out of a failed artistic career. Fast forward to real life after school. I moved to Seattle and couldn't find a job. After six months of unsuccessful job hunting, I found myself having a very difficult discussion with myself: pursue a seemingly failed design career or cash in on that back-up plan? I now work at Distilled, so you can guess what direction I chose. However, I only recently realized that all my indecisiveness and "dabbling" set me up for my current position as a marketer. Everything I now know is the outcome of a relentless focus on journalism and communications, which I can honestly say taught me so many invaluable lessons that are essential to marketing. I would go so far as to say that every marketer should be trained in journalism. So sit back, relax, and enjoy my part love letter to journalism, but more importantly part "if you don't know these things you need to level up right now" list of journalism principles and attributes every marketer needs to know. If you remember one thing, remember this. It is my mantra for everything. In journalism, it is the overarching principle that all journalists try to follow with their writing. It encourages writers to use descriptive storytelling, facts, and the manipulation of language to paint a story. "Mr. Cox was spiraling into a depression." He began abusing meth himself, went off his medication, landed in the hospital twice with pneumonia and eventually moved home with his mother in Atlanta. It was as if, like Jessica Chastain’s character at the end of “Zero Dark Thirty,” he helped kill Osama bin Laden, then found himself bewildered by the return to normalcy." The writer doesn't need to use the adjective "depressed". Rather, he showed the reader by using the strategic representation of facts to paint a picture of a man spiraling into depression without ever explicitly saying it. Makes you a better storyteller. See the above examples – which is more exciting to read? Journalism teaches writers to craft an article that compels readers to think, feel, or do something. Marketers especially want their content to compel readers to react, preferably in a way that will lead to a sale. However, it is important to note "storytelling" should not be confused with "conning". Teaches you to avoid generic claims and fill gaps in your story. Most marketers will produce content at some point in their career. Bad content is usually rife with generic claims and boring sentencing. For example, if the author had just written Mr. Cox was spiraling into depression, my first thought would be, "How do you know?" If a claim can be rebutted with a follow up question for more clarification, it's too generic. Highlights the importance of data. I never considered myself as data-driven or analytical (a number hater here). However, this concept in writing translates to all marketing decisions I make. Now instead of saying, "Our client's site architecture is confusing and should be changed," the conversation goes much more like, "Our client's IA is confusing because of X, Y, and Z facts I pulled from Analytics and should be changed." Forces you to be better at persuasion and negotiations. In the above example of a client recommendation, which statement is easier for your client to tear apart? The former has absolutely no backing and turns the momentum of the discussion into you defending your claim. The latter example brings reputable facts to the table and changes the dynamic of the conversation from defending your recommendation into discussing solutions. The "show, don't tell" mantra definitely makes you a better storyteller, but there are other aspects of storytelling and just general good writing that journalism helps develop. For one, it makes you an epic headline writer. One reason is because smaller publications that don't have copy editors leave it to the journalists to develop headlines that fit into a certain word count parameter. But even journalists that work at larger papers that have trusted copy editors pick up a thing or two about epic headline writing, which often has a direct, specific, and active tone that compels a reader to click on it. Besides headline writing, journalism also helps writers deliver a story people care about through the elegant use of angles. Great storytelling is all about how a topic is positioned. For example, Staples conducted a survey on attitudes toward holiday gifts and found that 56% of people don't like their gifts every year, among other facts. The press release headline and angle could have been "Staples Conducts a Survey to Determine Attitudes Toward Holiday Gifts." Instead, it went with the angle "Over 50% of Americans Will Hate Their Christmas Gift This Year." Both articles are true, but the latter delivers a different perspective on the findings. In order to master angles and storytelling, journalists embrace The 5 W's. The 5 W's consist of who, what, where, when, why, and for some odd reason the sixth-man-out "how". Just as we have marketing briefs, journalists make sure they can answer each of these components before writing in order to stay focused and answer the ubiquitous question, "Who cares?" The headline, angle, and 5 W's are just the backbone of any article. 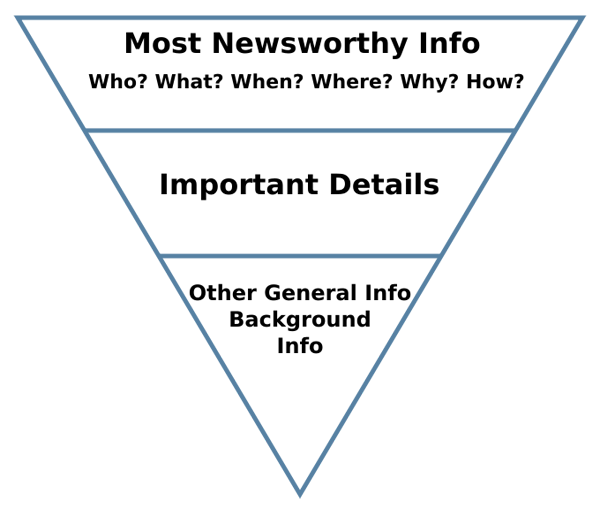 In order to write in true journalistic style, writers use the inverted pyramid to organize their story. This format has the most important facts at the top of the story with all subsequent facts outlined in descending order of importance. This, along with the AP style guide, defines the parameters in which most journalists write stories. It is up to each individual writer to be creative within these confines in order to stand out from his competition. If you haven't noticed by now, journalists love mantras, slogans, etc. While they are writing, one last tid bit they keep in the back of their minds is the K.I.S.S. acronym: keep it simple, stupid. This means they write as if the reader has no background information, in a jargon-free way that anyone can understand. Makes you a better PR or outreacher. Finesse for storytelling helps marketers with more than just article writing. It also helps them craft the perfect pitch by knowing how to analyze the recipient (your "audience") and position the ask in a way that is most likely to elicit a respond. Ensures your content is concise and skimmable. Web readers want the information and want it fast, meaning they are easily distracted and lusting after easy-to-scan content. By pairing journalism's inverted pyramid with online readers' love of formatting, you will be able to create content that gets to the point quickly. Forces creativity when working within defined parameters. If you are a content marketer, you are most likely very familiar with editorial calendars and guidelines. These parameters are essential to ensuring a consistent reader experience and brand message. The AP guidelines are just the journalists' version of a marketer's writing standards. These confines force writers to be creative while also ensuring a consistency, which is a procedure all content-producing marketers should follow. Journalism teaches writers to approach life with a healthy dose of skepticism. Nothing is taken at face value, which makes for better investigative writing, better interviewing, and a more balanced, unbiased end result. One of the best outcomes of this skepticism is a near-obsession with fact checking. If you find a strong fact or statement, it is five times stronger if you can find five other reputable sources corroborating the information. Engrains a "why" mentality. Formal fact checking is just as important for marketers, but that inquisitive nature helps in every facet of our job. For example, a "how can this be better" mentality gives marketers the confidence to challenge the status quo, which allows for innovation in our industry and huge wins for brands. Creates fierce editors. All marketing teams need a strong-handed editor on their side to ensure the content they create is epic. Journalists, unless they are opinion writers, are paid to report the facts. They are but a medium to tell a story in as unbiased of a way as possible. Thus, they rely religiously on research and sources to deliver a story. Once they narrow down what information they want to use, they attribute the facts to the appropriate source throughout the article. The use of expert sources and using them accurately instantly makes the journalist and his/her piece more credible. Do you remember what happened to Jayson Blair and every other journalist that was ever discovered to be making facts up or plagiarizing? They are often forced to resign and are forever a black sheep in the industry. That skepticism previously discussed stems from this truth about journalism: report the facts correctly or get the boot. Fact checking is but one measure journalists take to ensure accuracy; actually it's more of a "last checkpoint" insurance. Great journalists know the difference between primary, secondary, and tertiary sources, doing their best to get facts from a variety of different media, but especially directly from the original source (expert interviews, for example). It is considered lazy journalism when writers just take facts from another article they read on The Huffington Post. The best practice would be to go a step back to the original sources that writer used for his post. Instantly creates content that is more credible. We always talk about the customer funnel, but at the end of the day if a potential buyer doesn't trust your brand he won't purchase. Since content is so vital to most purchasing decisions, if you create content that attributes reputable sources you are positioning your brand as an unbiased authority. Notice the word "unbiased" – readers can sniff an agenda a mile away. While all brands have a bit of an agenda at the end of the day, if you can use external sources to back up your claims your brand will come across as that much more reliable. Remember, you want every piece of content you create to be the last piece a potential customer needs to read before moving down the purchasing funnel – credibility aids that movement. Teaches you how to be a better outreach prospector. There is a qualifying process that all outreachers go through in order to determine if a potential site is a valuable partner. Journalists know what to look for to determine if a source is credible – these cues are essential to their own reputation! For example, they know to look for accreditations, social proof, and the year of publication for secondary/tertiary sources. Outreachers need to look for the same cues everyday when prospecting – has this blog been updated recently (date of publication)? Does this site have a strong community presence (social proof)? Is the blog owner actually a professor with a PhD (accreditation)? As you can probably tell from the obsession with attribution, journalists are master sleuths and fact finders. This makes them impeccable researchers and interviewers who are experts at reading between the lines. They trust their gut – if a source looks uncomfortable and is evading answering a question, the journalist will know to start digging. These "sixth senses" can be the difference between a good and a great, breaking story. Forms an obsession with data and research. Anyone in marketing should be data obsessed – we need data in order to define strategy! From market research to competitive analysis, this obsession with accurate fact finding and sleuthing makes marketers better at not only the data-finding process but also the analysis of that data. As a result, journalists-turned-marketers are masters at finding holes in research and drawing conclusions through the careful construction of different pieces of information. Empowers you to think on your feet. That knack for interviewing allows journalists to think on their feet if a discussion goes in a different direction. This is an essential skill in just about every marketing function: client kick-off calls, interviewing for market research, hiring interviews, outreach negotiations, public speaking, and sales calls. Oh, and journalists' affinity for note taking comes in handy during all of the above marketing functions. Makes you a better outreacher. A tendency to sleuth is essential in outreach – these people sit on the internet all day looking for people to contact! Journalists need to find the appropriate person to contact for interviews; outreachers the appropriate person to contact in order to work with a website. Outreachers with a journalist mentality won't accept that the site owner doesn't put his email on the contact page; she'll go find it in some other way! Most journalists will either be responsible for managing other writers or be managed themselves. Traditional media publishers have content production management down to a science – why would marketers mess with a process that has made it possible for printed publications to be around since the 16th century? Creates a bulletproof framework for content publishing. 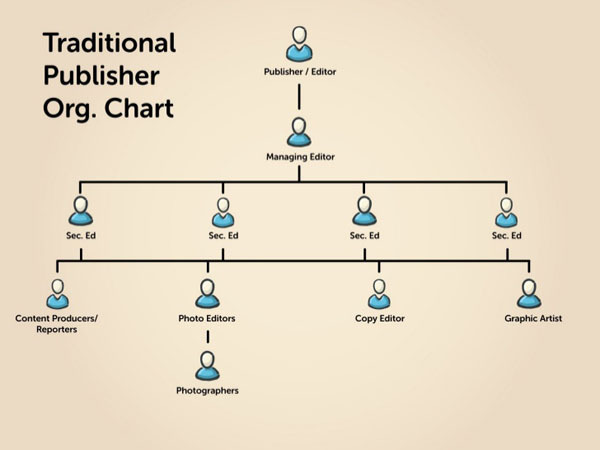 Marketing teams can learn something from the traditional media publishing workflow. By creating a smooth process for content production, we too can have an efficient flywheel for producing content. Demonstrates the importance of content governance. Besides creating an efficient workflow, adopting a formal publishing process also forces marketers to have a conversation about content governance. Content shouldn't be published by anyone in an organization who can use a computer. This kind of loose system creates that inconsistent reader experience and brand message that would make any journalist balk. There should be a very clear sign-off and ownership hierarchy when it comes to content production in order to be successful as content-producing marketers. Remember, journalists are at risk of damaging their reputation if they make up facts or plagiarize material. This risk stems right from our good old constitution. If you've taken any American history class ever, you most definitely learned about the first amendment and our "freedom of speech". Saves your business from lawsuits. The internet is a cesspool of plagiarism and non-compliant activity. However, being aware of laws and best practices for content creation is essential to minimizing potential litigation threats. Your creative and editorial teams should be well versed in copyright law and know when it is appropriate to quote, attribute, or use another piece of work. Helps your relationship with the compliance team. Many brands have risk-adverse compliance teams that can put huge restrictions on a business' content production workflow. By understanding fair use and copyright laws, for example, you can put your best foot forward and cultivate a better working relationship with these legal teams. Journalism taught me so much more than I can ever list in this article, everything from an incessant thirst for truth and justice to leveling up my language when asking for a guest contribution on another site (and yes, that's "contribution" not "guest post"). Journalism has made me a better marketer and convinced me that all marketing professionals should be trained in journalism best practices. While other backgrounds can certainly teach portions of the traits essential to marketing (statisticians are great at research an analysis, for example), I haven't yet found one field that teaches the breadth of skills that journalism delivers. So if you want to level up as a marketer, I encourage you to take some courses in journalism or hire a consultant who can help you apply journalism principles to your marketing department.